Feel like saying thousand thank you(s) to netgalley. If I had never gotten the email alert all those months back that they were putting a galley of it there, then I would never have picked up the Iron Fey series from my 'to-be-read' pile so soon. Thank you netgalley and thank you to the publisher for putting it on there. 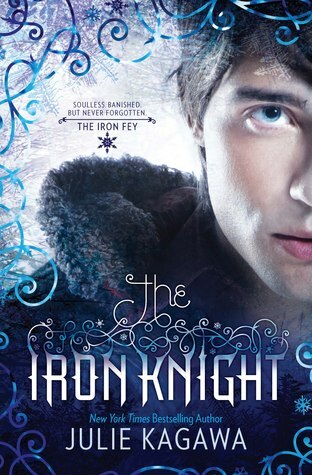 May I present an early review of the upcoming book in the Iron Fey #4 The Iron Knight by Julie Kagawa. Ash, former prince of the Winter Court, gave up everything. His title, his home, even his vow of loyalty. All for a girl… and all for nothing. Unless he can earn a soul. To cold, emotionless faery prince Ash, love was a weakness for mortals and fools. His own love had died a horrible death, killing any gentler feelings the Winter prince might have had. Or so he thought. Then Meghan Chase—a half human, half fey slip of a girl— smashed through his barricades, binding him to her irrevocably with his oath to be her knight. And when all of Faery nearly fell to the Iron fey, she severed their bond to save his life. Meghan is now the Iron Queen, ruler of a realm where no Winter or Summer fey can survive. With the (unwelcome) company of his archrival, Summer Court prankster Puck, and the infuriating cait sith Grimalkin, Ash begins a journey he is bound to see through to its end— a quest to find a way to honor his solemn vow to stand by Meghan’s side. To survive in the Iron realm, Ash must have a soul and a mortal body. But the tests he must face to earn these things are impossible. At least, no one has ever passed to tell the tale. And then Ash learns something that changes everything. A truth that turns reality upside down, challenges his darkest beliefs and shows him that, sometimes, it takes more than courage to make the ultimate sacrifice. As I stated above if not for netgalley I never would have picked up the Iron fey books from my tbr pile so soon......and to think would have missed out on so much. So lets get on with the review then. The Iron Knight picks up straight where the Iron Queen and upto some extent Summer's Crossing finishes. After the defeat of the false king Meghan has taken over or well accepted her destiny as the sovereign ruler of the Iron Court and in order to save her beloved Ash, who had sworn to be her knight had banished to save him from being poisoned by the Iron. Why? Because Iron is a kryptonite for the oldworld fey and Ash belongs to the Unseelie Court. In doing so not only is she saving Ash but also sacrifice her love for him(or so she thinks). But all is not over Ash has sworn that some way or another he would be with her in the end and would do anything in his power to get his happy ending with Meghan. And this journey is what we find within the pages of The Iron Knight. Ash along with Puck, Grimalkin and a certain "hunter" take the most peculiar adventure through Nevernever. What do they search for? A way for Ash to be with Meghan without the iron interfering between them. A jorney for Ash to gain a soul. A journey that stands the test of time for many have tried but failed. So can Ash, Puck, Grimalkin and "the hunter"succeed what had never been achieved? The very first page of the book quotes "Team Ash, This one is for you" and for all those Team Ash it is. While Meghan was sorely missed (although is in background here) but we understand The Iron Queen was the conclusion to her story but for Ash it was just beginning. The Iron Knight offers us a glimpse of the complexity that is Ash. We get to see in Ash's mind, his struggles to attain his promise that he had made to Meghan, his dark past, the nature of his relationship to Puck and with his past lover Ariella. For an Unseelie prince it is weakness to show emotion and Ash knows it. Not only is he loyal but there are true horrors in his past that he definitely never shares with anyone. Never giving in to his inner darkness ever. You all might even start questioning if Ash deserves redemption or not. His journey is a lot more that just finding his soul but becoming somebody else entirely. The harrowing steps of his journey break the Winter Ash bit by bit and out leaves an Ash who is free of the burdens of the past. Not just Ash but Puck also comes entirely as a new person here. When Ariella died he lost not one but two of his dear friends and inspite of lashing out he has held the pain inside and as you say it 'taking it in turns'. Puck is as fun loving as he is loyal and Iron Knight shows us a rather very serious side of him. Grim is still the same as ever with his cat-ly annoying "know-it-all" attitude. Julie Kagawa is the boss....for this definitely does not disappoint in the slightest. Twists and turns, coming to terms with your past, resolving centuries long enemity and seeing your promise till the end. This book definitely does not disappoint.